The Knighting of Admiral Francis Drake, Deptford Creek - April 1581. I have read many accounts of the knighting of Francis Drake at Deptford Reach by Queen Elizabeth 1 but have always known this was partly untrue. 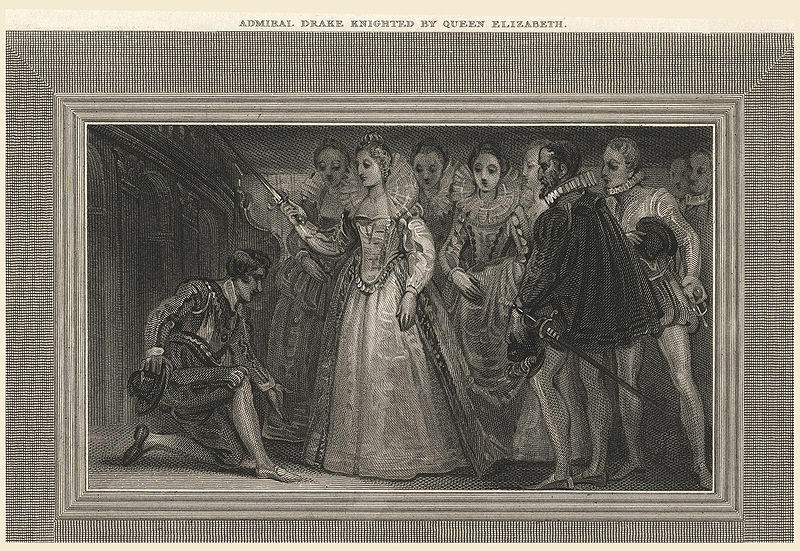 In April 1581 a great ceremony took place in Deptford Creek, the knighting of Admiral Drake. Many thousands attended this occasion and it was recorded that a makeshift walkway was erected for spectators to observe the occasion. Halfway through ceremony the walkway collapsed spilling nearly a hundred spectators into the Creek much to the amusement of the crowd. There was no loss of life. When researching articles of history referring to the actual knighting it always shows Queen Elizabeth 1 carrying out the dubbing. Evidently this is wrong! Drake was awarded a knighthood by commonly thought to be Queen Elizabeth aboard Golden Hind at Deptford Reach (Creek). In reality though he was actually Knighted by a French nobleman called Monsieur de Marchaumont. on 4 April 1581, and, in September 1581, became the Mayor of Plymouth. He was also a Member of Parliament in 1581, for an unknown constituency, and again in 1584 for Bossiney. In 1580 Drake purchased Buckland Abbey, a large manor near Yelverton in Devon. He lived there for fifteen years, until his final voyage, and it remained in his family for several generations. Buckland Abbey is now in the care of the National Trust and a number of mementos of his life are displayed there. The Queen ordered all written accounts of Drake's voyage to be considered classified information, and its participants sworn to silence on pain of death; her aim was to keep Drake's activities away from the eyes of rival Spain. Also considering the friction with Spain, on the occasion of the knighting, Elizabeth 1 handed the sword to the Marquis de Marchaumont, ambassador from France, and asked him to dub Drake as the knight. During the Victorian era, in a spirit of nationalism, the story was promoted that Elizabeth 1 had done the actual knighting.